Monto Clay ®, short for Montmorillonite clay, is a fired clay product used to amend soil. Montmorillonite is sold under other brand names such as Turface MVP®. The advantage of Monto Clay is the 1/4 inch particle size. 1/4 inch particles prevent dry spots, poor drainage and settling which can create acidic shock. Ideal for use in bonsai soil, cactus soil, succulent soil, hydroponics and amending soil to increase drainage. Montmorillonite is known for its cation exchange capacity(CEC). It's also a great acidifier. The acidic properties help offset the alkaline properties of other ingredients such as pumice and lava rock. Monto clay is a great substitute for Akadama. Condition: Screened, Tumbled, Dried and Bagged. Similar properties of hard Akadama. 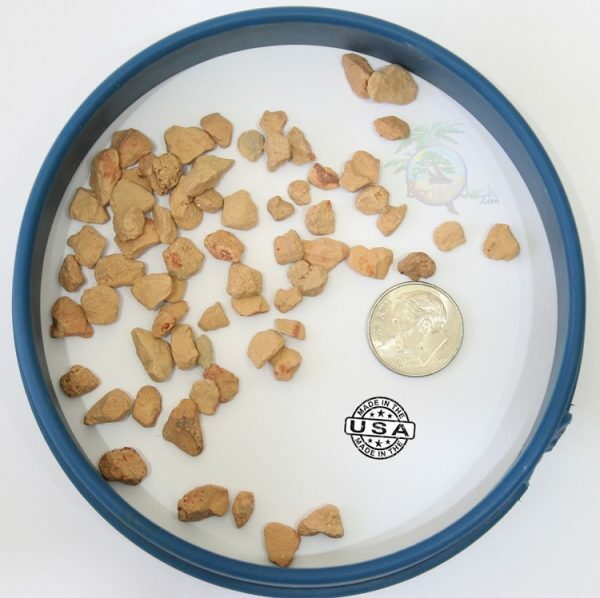 Uniform 1/4 inch Particle size prevents dry spots, poor drainage and settling. Monto Clay® comes from the same company, mine and processing plant as Turface®. It's the exact same product, only larger. Although this is technically 1/4 inch Turface we are not permitted to sell it as Turface®. This is because it conflicts with the Turface brand name. The folks at Profile products were kind enough to manufacture this product to our specifications. 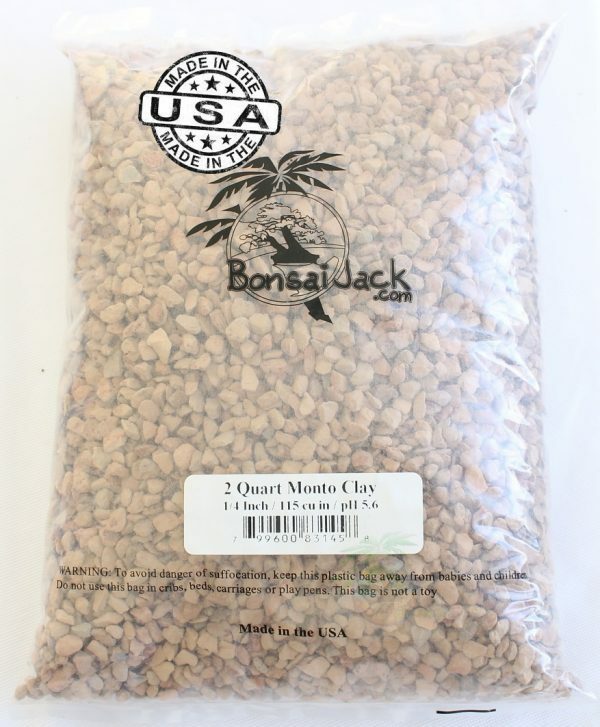 This product is exclusive to the Bonsai Jack product line. Cactus / cacti, succulent, orchid, fruiting, flowering and citrus. Fast draining soil blends that require an acidic additive. 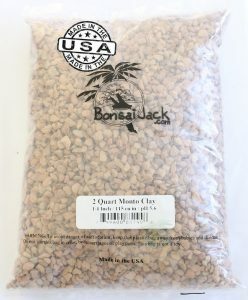 Hello – I want to add either Monto clay or Bonsai Block to a peat moss soil for tropical plants (not succulents or cacti) to increase the drainage. Do you have an opinion about which would be best for that? Thank you. Thanks a million, Jack, I’ll use the Monto clay. Is this product similar to seramis? I was also confused with their statement about being ph neutral……………..IT IS NOT! I can send you a sample if you like for testing. I’ve been able to lower the ph by boiling the sermais, letting it sit in water over night and rinsing with clean water before using. That’s good information. You are correct. Seramis and Moto Clay are acidifiers. That is a good thing though as it offsets the alkalinity of other ingredients without the need of organic acidifiers such as pine and fir bark. No samples needed thanks though. We are pretty booked up on the product line until 2019. Have a great weekend. Hello Lety. I wish I had a clear answer for you but I have not seen Seramis in person before. The product looks very similar to Monto Clay. It appears to be the same thing according to this statement “Seramis is “calcined montmorillonite clay”. Monto Clay is also a calcined montomorillonite clay product. I am confused because they mentioned Seramis is pH neutral. Which is not true if its Montmorillonite clay. pH neutral statements are common among the gardening industry when the vast majority of them are untrue. Montmorillonite is an acidic clay product. I would be interested in hearing your feedback if you have some Seramis to compare with Monto Clay. We will also be happy to lab test, at not charge, any Seramis samples you send our way for comparison. Seramis is not available in the USA. I checked the USTPO to see if the name has been trademarked. It was originally trademarked by SERAMIS GMBH from Germany and it is now owned by Mars, Inc, the same guys that make candy bars. They may have an interest in marketing the product in the USA or could be holding it as an asset. I hope this helps. Please be sure to try it before relying on it.